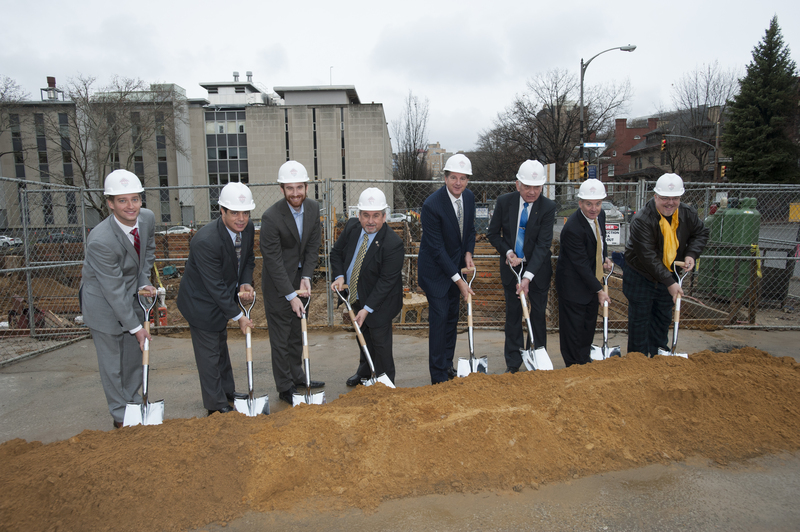 Elmhurst Group broke ground December 6, 2013 on Schenley Place, a 105,000 square foot “Class A” office building with seven stories and three levels of underground parking. Schenley Place is located on Bayard Street and Ruskin Avenue in Oakland. Elmhurst Group signed a long-term land lease with First Baptist Church of Pittsburgh for this project, which is estimated to be completed by March of 2015. The First Baptist Church of Pittsburgh in 2004 hired Paul Horan, Founding Principal, and Ralph Egerman, Principal, of Colliers International | Pittsburgh for assistance in increasing its cash flow and providing funds to improve the 100 year old church building. Mr. Horan and Mr. Egerman suggested to the Board of Trustees that their parking lot had significant value as a development site, and they were retained exclusively by the Board to develop a Request For Proposal and conduct interviews with carefully chosen developers. The Board of Trustees selected the Elmhurst Group to be the developer for the project and a long term ground lease was executed to improve the Church’s finances. “Paul and I feel very privileged to have had an opportunity to work with the Church and Elmhurst, on this exciting project. Colliers International | Pittsburgh is proud of our work on behalf of non-profits and our role in the growth of our city,” said Ralph Egerman, Principal at Colliers International | Pittsburgh. It’s a marathon, not a sprint – We hope! The Pittsburgh Industrial Market got off to a slow start coming out of the gate in 2013. The 1st Quarter saw very few transactions of significance as buyers and tenants consider the impact of a soft economy, and lingering concerns surrounding the federal budget. The Greater Pittsburgh vacancy rate changed little from 4th Quarter 2012 with a slight drop to 7.9% from 8.1% the previous quarter. Available Class A product continues to remain scarce, and at the risk of beating the proverbial dead horse, no relief is in sight in the form of new speculative product. That said, the market is anticipated to give back two large blocks of space of existing product. Flabeg recently announced that they are ceasing operations at their four year old solar glass manufacturing plant in Findlay Township. This 228,000 SF facility would represent the largest block of Class A product in the market when it is made available. In the north, United Stationers will be vacating their 124,000 SF Cranberry building. Looking forward, we believe the 2nd Quarter will prove more robust than the 1st Quarter. Unless there is additional unanticipated negative news on the economic front, the pent up demand from companies already kicking tires in the market is sure to result in more transactions. PITTSBURGH, March 6, 2013 – Colliers International | Pittsburgh is proud to announce that NCS Services, Inc. will be moving its headquarters from Cranberry to a new 10,200 square foot office space in The ONS Building, located at 125 Enterprise Drive in the Parkway West Corridor of Pittsburgh. Jessica Jarosz, Vice President of Tenant Advisory Services at Colliers International | Pittsburgh, was engaged as the Exclusive Tenant Representative to NCS Services, Inc., securing the new 10,200 square foot office lease. Adam Viccaro & Jeremy Kronman of CBRE represented the landlord in this transaction.